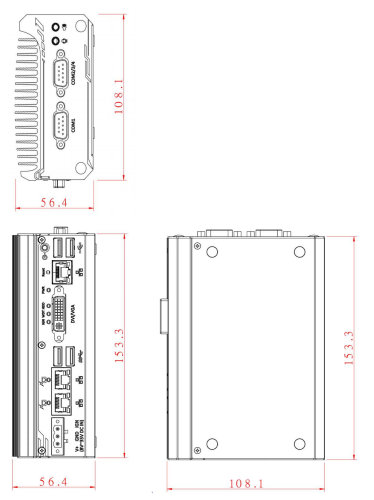 Optional digital I/O, USB 3 ports, SATA port, etc. Leveraging 14 nm lithography, the latest Intel® Apollo Lake™ processor brings a significant performance advance. This quad-core CPU offers up to 1.5 times the CPU performance and 3 times the GPU performance of the previous generation Atom™ E3845 CPU. This computer is ready to be connected to the latest digital cameras. There are three Gigabit Ethernet ports with Intel I210 controllers. The Intel I210 controller enables efficient transfer of jumbo Ethernet packets and is supported by many camera drivers, including the Basler Pylon performance driver. Each port has an independent controller so that each port can provide full bandwidth. Two ports can deliver up to 25.5W to each camera, per IEEE 802.3at PoE+. There are also two USB 3.0 ports and two USB 2.0 ports that share a controller. 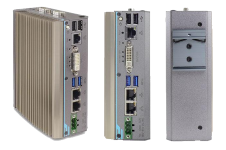 The optional CRNS993 MezIO card can add additional ports and controllers. This rugged industrial computer is free of moving parts. There are no fans or spinning disks to fail. It handles temperatures from 0 to 70 degrees C, even under 100% CPU load. The computer can be mounted on a DIN rail or, with optional bracket, mounted on a wall or back panel. This industrial computer is expandable to enable additional functionality. MezIO™ modules may be added for 2.5" SATA HDD or SSD, 8 or 16 channel digital I/O, 4 USB 3.0 ports, or in-vehicle ignition power control. Our standard configuration is great for many projects. It includes eight megabytes of DDR3L RAM. The 128 gigabyte Solid-State Drive has no moving parts to fail, and enables the system to boot in just seconds. Microsoft Windows 10 IoT Enterprise 64-bit is pre-installed. Alternate configurations are available for volume customers – please ask us for details.